Air Bubble Sheet / Rolls are available in 1mtr and 1.2mtr width . Standard Length of the Roll is 100mtrs and Bubble dia is 10mm X 4mm Height. Material is available in various thickness, from 50gsm to 160gsm. 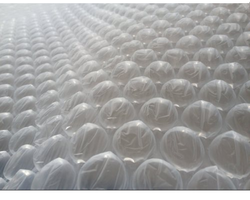 We are one of the trusted companies of Bubble Wrap. Our products are enormously admired in the market owing to their top features. Backed by rich industry experiences; we are highly engaged in trading a premium quality range of Bubble Roll. Manufactured with latest technology, our wide range of Antistatic Bubble Bags is appreciated all over the world frothier durable and reliable performance. These are available in cut sheets, pouches and roll form with surface sensitivity of < 10^12 ohms/sq. 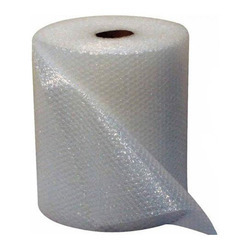 We offer to sell packaging rolls, laminated packaging rolls, air bubble packagingrolls, air bubble rolls, packaging film rolls, bubble packaging filmrolls. Air bubble packaging sheets, air bubble bags, air bubble pouches, air bubble rolls and pouches etc.